By hand in a bowl: stir the flour and salt. Add the Tenderflake, toss lightly into the flour with your fingers, and cut in the flour with a pastry cutter until the pieces of lard are no larger than hazelnuts and no smaller than baby peas. Don’t worry if the pieces are not all the same size. Add the liquid and cut it in for 2 to 3 minutes or until there is no loose flour in the bottom of the bowl and the dough looks like gravel. Dump the dough onto a work surface. Use your fingertips to pinch it together unit it starts to come together into a ragged mass; or smear the dough with the heel of your hand. * For flakier pastry, knead just long enough to get it to hold together. Scrape up the pastry dough with a bench scraper. Preheat the BBQ using the diffuser kit or indirect heat to 190°C. Flatten dough into a disk put into a buttered 9 inch pie dish. Use the sides of your forefinger to push the dough into the corners of the pie dish. Trim dough to meet the edge of the pie dish. Prick the bottom of the dough all over with a fork. Line the shell with parchment paper, leaving a 1-inch overhang. Fill with pie weights or dried beans. Grill(indirect heat) until the edges are just beginning to turn golden, 15 to 20 minutes .Remove the weights and parchment paper. 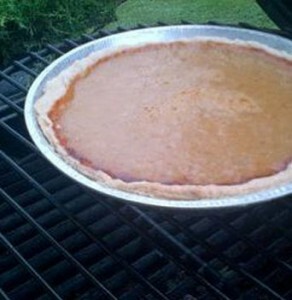 Return the crust to the grill; continue baking for 15 to 20minutes until light golden all over. Cool completely. Reduce the BBQ temperature to 175°C. In a large bowl, whisk together the pumkin, sugar, cinnamon, ginger, nutmeg, salt, whole eggs and evaporated milk until combined. Pour the mixture into the cooled crust and bake-Grill (indirect heat) until the filling is set around the edges but still slightly soft in the center, 40 t0 45 minutes. The filling will be slightly loose in the center but will firm up as it cools. Cool completely and garnish with whipped cream. Recipe thanks to Broil King. This entry was posted on Wednesday, October 29th, 2014 at 9:32 am	and is filed under Barbecue Recipes. You can follow any responses to this entry through the RSS 2.0 feed. You can skip to the end and leave a response. Pinging is currently not allowed.